For more than 25 years, the QS company has been ranking the best universities in the world. This is the second year of QS company Business Masters specialised rankings for categories Management, Finance and Business Analytics, which were published yesterday. The Faculty of Business Administration succeeded in the Management category. 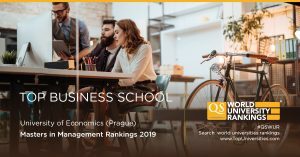 Programme CEMS, taught as well at the Faculty of Business Administration, has been ranked number 8 out of 135 schools globally in the QS Masters in Management rankings 2019, and therefore repeated its success from last year. The programme is designed for students with interest in the international business environment with outstanding academic performance. The programme is run through a partnership of 31 leading business universities across five continents. In April 2018 the University of Economics, Prague (VŠE) celebrated its 20 years as a member of the CEMS Alliance. The Faculty of Business Administration itself was ranked in category 100+ in the QS Global Master in Management Ranking 2019. In total, only 135 universities from all over the world were ranked. The QS evaluates five key criteria: employability, alumni outcomes, value for money, thought leadership and diversity (diversity of students and teachers). It was in the category of diversity where the Faculty of Business Administration scored highest from all the criteria. The universities from Western Europe or the United States of America achieved the first ranks, namely HEC Paris (1st) and London Business School (2nd).